Sometimes you do not want to see all bones at once to reduce clutter on your screen. The Bone display settings directly correspond to the Avastar Bones. 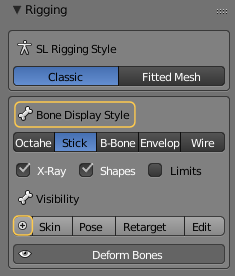 You can enable/disable the visibility of each bone set by enabling the corresponding view button (see image). Note: Selecting a part will display the bone group. You can not disable visibility of ALL bone groups. Hence at least one of the bone groups is always visible. Bone Display style: To change the bone shape. 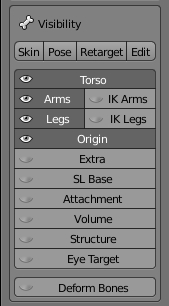 Note: The additional entries in this panel are “borrowed” from Blender and made available on the tool shelf to have all functions at one place and thus avoid frequent switching of the focus. Note: In the tool shelf the Bone Visibility Panel can be collapsed and expanded by clicking on the small plus sign to the left of the Bone Presets.